Greetings! For large and temporary events, we’ve been offering the mainland sims of Balance, Bethel, Brilliant, Fame, Fortuna, and Georgean for rent. However, this has become a growing issue for folks using those sims for their original intended purpose…vehicle testing! To solve this, we’ve set up 6 new mainland sims (Ruthenium, Rhodium, Palladium, Osmium, Iridium, and Platinum). These sims will be used exclusively for rentals from now on, and we will be leaving the vehicle testing sims alone to allow Residents to use them for uninterrupted vehicle testing. For details on how to rent these new sims, please see our Land Rental page. When they are not actively being rented, they’ll be left as a natural space for Residents to visit and wander. Hurrah! Thanks for listening to all the folks’s concerns about the Vehicle testing regions. This is a great way to accommodate both the needs of the testers and the people needing large regions to hold temporary events. Looking back over the vehicle sims data, do y’all find that the rentals generally cover the cost of keeping the sims online? Is there any implied or official mandate that these new sims break even at wholesale hosting cost? Don’t answer, of course, if it’s a deep corporate secret. Renting these sims is one of the ways we provide a L$ “sink” to help us better manage the stability of the inworld economy. We also encourage folks to rent land directly from other Residents whenever possible, since that’s a good business opportunity for Residents. I noticed it yesterday when checking the rent page – and wondered when it’d happened – good work. I really like this idea, especially the whole thing of having a natural park when the sims are not in use. Any chance we could get an addition adjacent to Dougall for hosting events on the TG? (To the south, not the west!!!)) I think it’d be a great thing for someone who needs a couple days to host an event, or finish a big project. Yay! Time to whip out the old warthog and go driving around and around and around and around again! I, and I’m sure many other vehicle enthusiasts, deeply appreciate this. Thank you so much! I are a happy kitten, thanks Pathfinder and the gang at LL! This is superb news! Vehicles are a lot of fun but it was getting to the point where there just didn’t seem to be anywhere to use them anymore on the grid because of ban lines, massive builds and security scripts. It’ll be great to have the vehicle sims back. Are these just regular sims, or are they hosted on high capacity units of some description specifically designed to handle a heavier load than the average region, by the nature of their intended purpose as event locations? They are regular mainland sims. Seems possible. I’ll touch base with Blue and see what he thinks. Is there a list somewhere of Residents who rent out entire sims for temporary events? If so, can someone post a link to it? I’d like to use this blog entry to share that information with everyone. And if there isn’t a list, and you rent entire sims for temporary events, please feel free to add your own information here in a comment. I can compile the entries and modify our land rental page to help better direct folks to Resident-run sim rental options. Excellent! This is fantastic news for both event organizers and vehicle buffs. I know a lot of vehicle owners have avoided the vehicle park for months now because it’s usually closed access or no-script. And event organizers had to contend with sandbox users and confused drivers who blundered into an event area, expecting a vehicle park. This solves both problems. Wait wait wait… Doesn’t this “public land” kinda step on the toes of the resident-run Public Land Reserve? They solicit donations, tier, etc from residents in order to maintain large public areas of land. Now Ll comes in a puts up SIX sims of public-use land, and they get to advertise it on their website and the “official” blog? sigh…. Aaron, I don’t see how it steps on anyone’s toes regarding other places of nature in Second Life. We’ve had the 6 vehicle sims lying dormant whenever they weren’t being used for rentals. 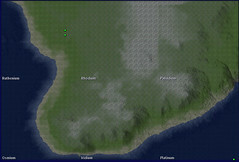 These new 6 sims are part of the mainland, and serve the exact same purpose. Also, folks can’t schedule events in the events calendar on these sims when they’re not being rented. I planted trees across them simply because I thought it would be nicer than leaving them completely barren in between rentals. If anything, I think having them be woodlands raises awareness about how natural spaces in Second Life can be a beautiful resource. Is there an inworld kiosk listing Resident-run natural woodlands? If so, perhaps I could put some of these kiosks on the sims telling people “if you like this forest, be sure to visit these permanent Resident-run nature preserves” ? My guess is there is very little in the way of “resident run nature reserves” for one simple reason… it costs us $195 per month per region to provide them, with absolutely no way of making back any of that outlay, whereas to you it’s entirely free. Until Linden Lab provide incentives for those of us who offer non-commercial activity in Second Life, I very much doubt if there will be many either. It’s an issue I’ve bought up with Philip, who after a month asked me to contact Jeska (instead of simply hitting “forward” instead of “reply” on my email; and I’m still waiting for a response. It does certainly give the impression that Linden Lab is only interested in money instead of quality. We want Residents to have the opportunity to create self-sustainable projects and to give folks the best possible tools to allow a wide range of creative expression. Just like in Real Life, in Second Life it takes planning and organization to manage a project that thrives and grows over time. There’s a great deal of “non-commercial” activity in Second Life. The growing live music community is a wonderful example, where artists play for “tips” as opposed to charging admission. Another example is Dreams island, a place for stroke survivors to get online support. I think there are many viable models for managing sustainable non-commercial projects. Land maintenance fees can be offset by soliciting donations or tips. Groups donating land tier. Sponsorship by organizations or patrons. Fundraising events. With some careful planning and hard work, anything is possible. A quick note about comments. If you look at my main blog URL, which can be found on the main blog page by clicking on my name in the list of Authors in the right column, you’ll see I’ve got “guidelines for comments” at the top of the page. Please read and follow them, as that will help keep comment discussions here as focused and constructive as possible for everyone. We’ll soon be posting broader and very visible comment guidelines on the main blog page. That will be the subject for a new blog post in the very near future which everyone can discuss in the comments, so please keep comments on this current blog entry relevant to the issue of rental sims. Thanks!